I cant stress enough how amazing this office is! I absolutely love it. The staff is so welcoming and help fordr Allen was great! Everything you want he takes the time to sit and talk to you love love love it ! My new favorite Dr!! I cant stress enough how amazing this office is! I absolutely love it. The staff is so welcoming and help for dr Allen was great! Everything you want he takes thetime to sit and talk to you love love love it ! My new favorite Dr!! Very pleasant atmosphere, didn’t feel rushed at all. Staff was helpful with information and referrals. Dr. Allen was born in Manila, the capital of the Philippines. He lived there until he was four and then returned with his missionary parents to the US. He grew up in California and attended Pacific Union College as an undergraduate, graduating with honors. He attended Loma Linda University Medical School on a scholarship from the US Air Force, and then completed a residency in Family Practice at Travis Air Force Base in Fairfield, California, receiving the Goff-Hougas award at graduation. He was then stationed at Nellis Air Force Base for two years. He spent his final two years in the Air Force at Izmir Air Station in western Turkey. After leaving the Air Force at the rank of Major, Dr. Allen moved back to southern Nevada working in several clinics before getting a position as a staff physician at Fremont Medical Centers, eventually being promoted to Director of Primary Care before deciding to pursue other options. 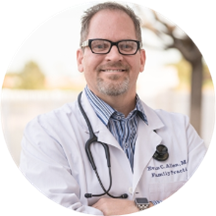 He spent a year at Diagnostics Center of Medicine in Henderson, but he felt he would be able to offer the best care as a solo practitioner. He opened his current office in Henderson in June of 2007 and has enjoyed steady growth in his patient volume and his professional satisfaction. He endeavors to offer full-service family practice and admits his own patients to the hospital when circumstances allow. He was recently named one of the top Family Physicians in the nation. He is also involved in the teaching of medical students and NP students and is on the clinical faculty of Touro University. Dr. Allen has fluency in English and Spanish, as well as some Turkish that he learned in Izmir. He has limited German. He enjoys watching basketball and football and plays racquetball as well as studying the classical period in ancient history, linguistics, psychology. Every one was awesome, front office was professional and knowledgeable. My doctor was asking questions, listening to my concerns. I love this Dr.’s office! Not only do I have the best Dr in Nevada, all of the staff is beyond helpful and very compassionate! Love this office!! Doctor's listened and asked questions. Very kind staff all around. Have always thoroughly enjoyed being a patient here! I had not been to the Office for 2 years - glad to see that the office staff has gotten back to a friendly competent group. Friendly check in. I barely managed to sit down after handing my paperwork in before the nurse called me in. I did not sit long before the PA came in to discuss my reasons for coming. Dr. Allen is a greatguy. Very friendly, knowledgeable, and up front. Definite recommendation! Makes patient feel welcome and relax. Comfortable to communicate with. Very pleasant service from the nurses as well. Excellent drs i was thoroughly impressed with this office from staff to drs! Dr. Allen's clinic is one of the best in the Las Vegas area. Both of the PA's in the clinic are knowledgeable and very helpful. I highly recommend it! Very personable. Made me feel comfortable. Very glad I picked him. I was seen 4 times by this Doctor's office and gave them my current medication list. I requested a refill through CVS for my Asthma inhaler that I get filled every 3 months and they told me that I would haveto make ANOTHER appointment to get this medication filled, because I never had it filled at my first visit! I did not need a refill at the time of my first visit!!!! I told them I work 6 days a week and the reason I gave them my medication list is so I could get refills in the future! CHANGING DOCS!!!! I wonder if this would be insurance fraud??? Love that they have their own lab on premises! I love ariel dunson she is the greatest doctor and all the receptionist they are awesome! Everyone who works there was great! I felt as if they actually liked there jobs and cared about me. Definitely friendly and i felt comfortable. I definitely will keep this as my primary physician! ! Everyone was very friendly. I appreciated the fact that no one rushed me and i was made to feel that i was a person instead of a copay. I saw Arial, Wendi, and Dr Allen. I was amazed by their professionalism and focus on my medical needs. I just moved here from out of state and they did such a thorough job with my medical assessment, I was trulyimpressed. They were extremely proactive in finding the correct treatment for my medical illness as well as focusing on preventive care. Great bedside manner, great nurses, great in general!!! Very helpful front office staff; they took the time to call insurance carrier to clarify details. PA was professional and had read my file which was reassuring. Dr. Allen was low-key and friendly. Labs were available on-site. All in all a good experience. caring, effective communicator, direct, thorough, kind and compassionate. I love his PA Ariel. Did not like Wendy at all the last time I went, she was very judgmental and unhelpful. Ariel however was very informative and open, as a good medical professional should be. This time, the wait wasextremely long, however usually it is about 30-60 minutes, not over an hour! I waited An hour and ten minutes after my appointment time just to get into the room. The Staff is a breath of fresh air! Dr Allen is a great asset to Henderson, NV! I liked his approach to Health Care. Dr. Allen is one of the BEST DOCTOR'S in Las Vegas/Henderson. His entire staff is amazing & efficient. I wish every doctor/doc's office were exactly like Dr. Allen and his team. They're incredible. Dr. Allen is really a great doc. He is not with you very long, but he is kind, thorough, and knows his stuff. Just don't be late, or a "no-show", because they charge out the wazoo. Charge way too much todo any paperwork for you, as well. Otherwise, satisfied customer. Professional, thorough and compassionate attention. I'm a new patient and feel like I've made a great choice going with Dr. Allen and his team. Dr. Allen has been my doctor for many years. I trust him and he has always been there for me. I could not have had a better care. Of course I recommend him any time. It was a great visit with lots of information. Looking forward to the test results and the new test that are soon. I did not enjoy my visit with dr. Allen. I felt that he/his staff pressured me into the allergy test (even though I was experiencing a full body rash) simply to sell the expensive "customized" allergy drops. He was more intohis laptop than my concerns and I still don't know what was wrong with me. I enjoyed meeting this doctor he is very knowledgeable and spreads his knowledge. The few times I did get in to see Dr. Allen all he seemed interested in was allergy testing. I felt like all of my other issues and concerns were always dismissed and he kept pushing me to get allergy testing.Can never get an appointment either. Off to find a new Doc. I really liked Dr. Allen and his office staff is wonderful!!! It was quick. He was polite; seemed really busy.